DARTMOUTH — Twenty-eight Dartmouth and Westport artists that teamed up this summer to organize the annual open studio weekend, donated over $4,800 to the Lloyd Center for the Environment in Dartmouth, to be used to support the Center’s ongoing environmental science programs in the Westport and Dartmouth public schools. In its fifth season, the Art drive artists have now donated a combined total of nearly $18,000 to the Lloyd Center. 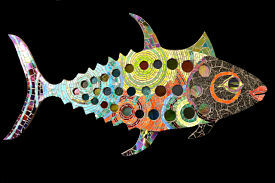 This year’s feature event was Fabulous Fins, participating artists applied their own unique creativity and styles to create large, colorful depictions of Yellow Fin Tuna, another favorite of the Southcoast, and a species known to the area. Stationed outdoors along the Art drive routes – in public spaces and in front of stores, shops, businesses and other sites in Dartmouth and Westport – were 42 four-foot-long Yellow Fin Tuna. The general public had the opportunity to bid for them on eBay. A percentage of the income added substantially to the collective Art drive contribution to the Lloyd Center. 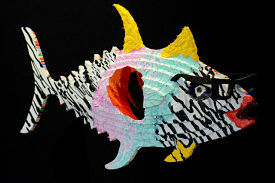 The construction of the fish was made possible by Concordia Yachts, Dartmouth Building Supply and Cape Cod Cupola Co.
As part of the Art drive’s own outreach program Rising Stars, students from Dartmouth, Westport and Bishop Stang high schools’ art departments once again exhibited outstanding student work at Cape Yachts’ South Wharf in Padanaram during the Art drive weekend. Consisting of some of the area’s premiere painters, ceramic artists, photographers, jewelers, woodworkers and others, the Art drive uniquely puts emphasis on a consistent and high level of professionalism and quality in some very unusual and dramatic studio settings. Lovers of the arts enjoyed a great weekend escape while touring these historic Massachusetts Southcoast towns. With only 15 miles separating the 30 studios, visitors enjoyed a casual drive through this picturesque area with ample time for a picnic lunch or to dine at area restaurants. The Art drive artists individually donated a percentage of their sales to the Lloyd Center for the Environment. Dartmouth resident artists Beverly Carter, Sandra Hall and Deborah Quinn-Munson founded the Art drive in 2008 to give visitors an opportunity to sample the concentration of creative talent in Dartmouth and Westport. This year, participating Art driveartists included Gary Adriance, Maddy Bragar, Beverly Carter, Peg Call-Conley, Sarah Daughn, Janet Egan, Deborah Ehrens, Deborah Quinn-Munson, Brenda Figuerido, Ray Genereux, Wendy Goldsmith, Sandra Hall, Mary Harman, Tracey Mahaffey, Michael Hubert, Donna Huse, Marty Keating, Roger Kizik, Frank McCoy, Barbara McDowell, Dora Atwater Millikin, Sarah Morse, Seth Rainville, Sabrina Satkin, Jim Sears, Karen Minati Snyder, Susan Strauss, Janie Owen, and 26 Rising Stars. Along with the participating artists, the Art drive was sponsored by many local businesses including Community Sponsor: Hawthorn Medical Associates; Founding Sponsors: Anne Whiting Real Estate, The Sylvia Group of Insurance Agencies, FLORA and Flora & Foglia. Inc., Partner’s Village Store, and Friends Academy; and Supporters: Dedee Shattuck Gallery, Dartmouth Dermatology, Details and Design, Folia, Karyne and Company Day Spa, Milbury and Company, Norton Gallery, Osprey Sea Kayak Adventures, The Ries Family, The Law Offices of Rusitzky and Russell, Salt Marsh Pottery, and Westport Lobster. Go to www.the-art-drive.com for evolving details of the sixth annual Art drive, scheduled for the weekend of August 10 & 11, 2013.